Make your own crispy, crunchy, seed-filled crackers in less than an hour. 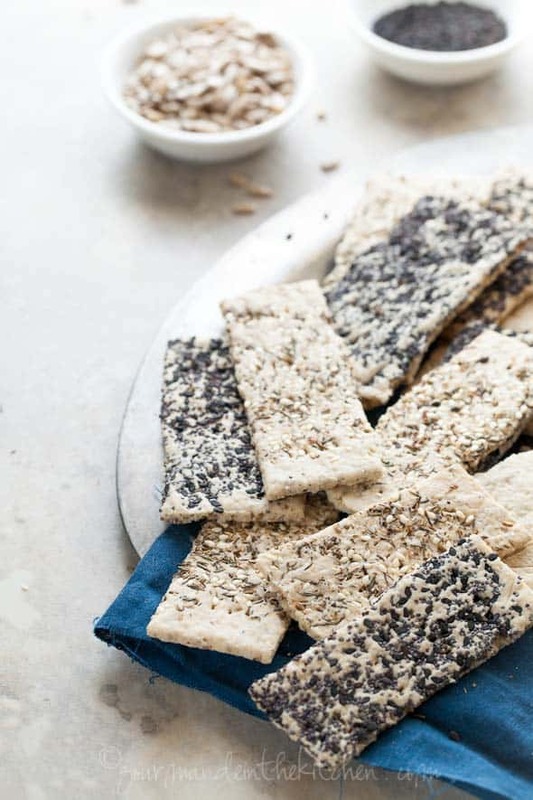 Welcome to my latest obsession – homemade seeded crackers. 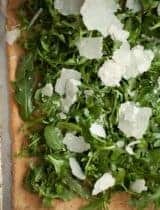 Light and crispy with a pleasant snappiness, they are the perfect canvas for all manner of toppings. I like to make mine three ways: plain with an extra sprinkling of coarse salt and pepper, four seed with black sesame and poppy seeds, and for extra zip topped with za’atar, a fragrant blend of thyme, sesame seeds and sumac. 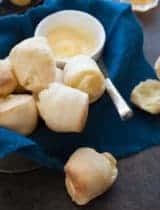 All they take to make is handful of ingredients that are quickly whirred into a ball of dough in the food processor and rolled out between two sheets of parchment. 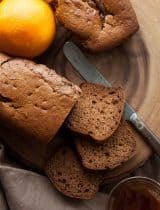 They get their satisfying toastiness from a base of sunflower and chia seeds and baked low so they crisp up nicely without over-browning. The result is a stack of snappy crackers ready for munching. You can make them into whatever shape you like. Rolled out thin and cut into long strips they make an excellent scoop for whatever dip comes your way, or cut them into more generous rectangles to use as a vehicle for spreads or making avocado toasts. 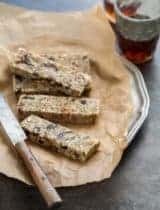 Cut them into squares and they’re just the thing for nibbling on before dinner with a piece of cheese and a glass of wine or alongside a bowl of soup. Any way you choose to make them they are ready in less than an hour and keep well for days for whenever that crispy/crunchy/salty urge strikes next. Have you ever made your own crackers? Olive oil for brushing crackers with toppings. Combine sunflower seeds , tapioca flour , chia seeds , salt and baking powder together in the bowl of a food processor; process until fine and powdery. through the shoot until dough starts to come together and forms a ball. Pat dough into a square onto a large piece of parchment paper and let rest for at least five minutes (dough will be sticky). Place another piece of parchment on top and roll each into a rectangle about 1/8- to 1/16 inch thick. Using a pizza cutter or sharp knife divide the dough evenly into long strips or rectangles. Prick crackers several times with a fork and sprinkle with additional salt if desired. Sprinkle with desired toppings, place parchment on top again and roll once over. Remove top parchment and place the bottom parchment on a baking sheet. Bake rotating once, until crackers are just starting to turn a golden color around the edges (about 20 to 22 minutes). Turn off oven, and let cool completely on baking sheet with door ajar for the crispiest crackers. Crackers can be stored in an airtight container up to one week. These sound delicious - the more seeds the better! 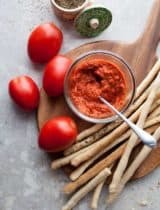 I'm pretty obsessed with just making an array of dips and calling it a 'meal' so I love the idea of taking it to the next level with homemade crackers! I love these crackers and all of the things that are packed into them! 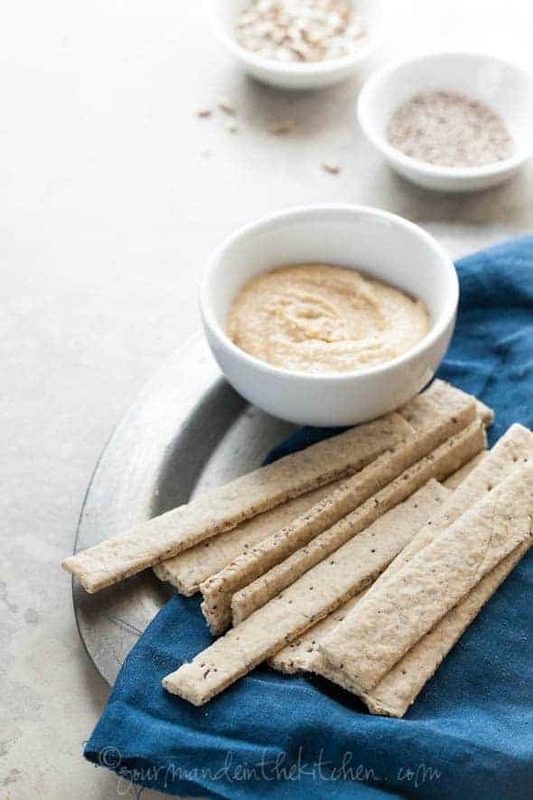 I love this idea of making your own crackers w/ seeds Sylvie - they sound spectacular! These crackers look fabulous! Love all the seeds! The crackers look fabulous, but in typical food-blogger fashion I'm totally lusting over those spoons! Um, hello gorgeous! They look great. These homemade crackers are a thing of beauty! 1. These look delicious! 2. 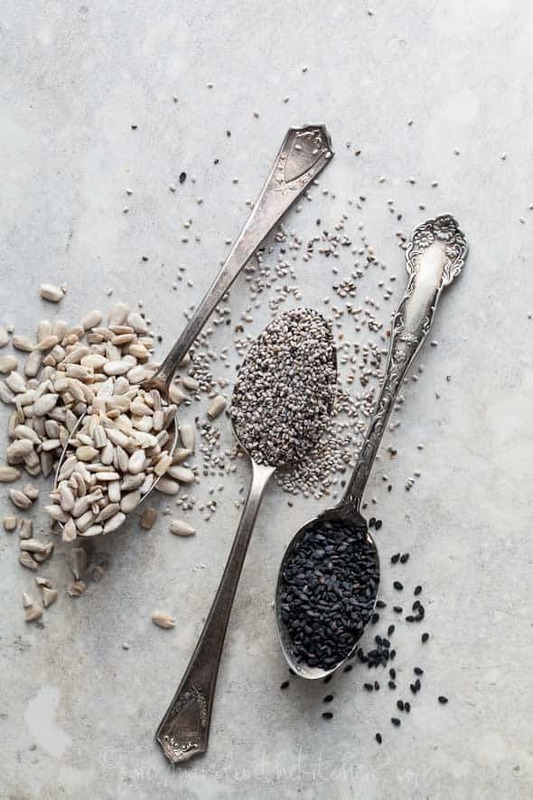 The photo of the spoons full of seeds is amazing! Sylvie I'm so excited about this post! We are gluten-free and I have not really explored making crackers. We eat chia and hemp seeds in bread but I've thought it should be easy to make crackers with them too. I will be trying your recipe this week! Thank you. You make the best crackers, these look delicious! I've always wanted to make homemade crackers, and these look so perfectly easy! I bet they'd be so wonderful with hummus, too. Thanks for sharing! I keep saying I'm going to make homemade crackers but I haven't done it yet. These look too good not to try. These look so delicious! I'm a huge fan of seeded crackers too, and love them with Norwegian gravlaks. So beautiful! I love crackers like these. Chia seeds are new to me but something I really want to try out. Thanks for another great recipe Sylvie. These look so yummy! A great crunchy snack. I'm assuming in step 2, you just accidentally left out the chia seeds? thanks! Yes thank you for catching that! I've updated it now. 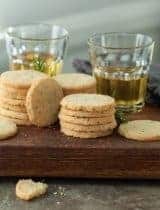 Homemade crackers are so wonderful! Love this! Loving these seeded crackers of yours Sylvie! I'll take a whole tray full. :) So sorry to have missed you last week as I was down with the flu. 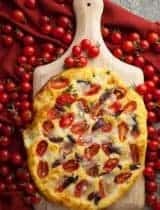 Thank you for sharing this fabulous recipe and have a great week. Pinning! These crackers look perfect! Yeah, the more seeds the better!! Noooo, I haven't yet made me own crackers. I'm a bit afraid - which is ridiculous but. Still. Afraid. BUT these look delicious. Do you think I can use a stand mixer instead of a food processor to mix the dough? No, you need to use a food processor to grind the nuts and tapioca into a flour so a stand mixer wouldn't work. You could try a blender instead to make the flour and then stir in the wet ingredients by hand. And with your skills in the kitchen crackers would be a piece of cake! We so love the look of these crackers! 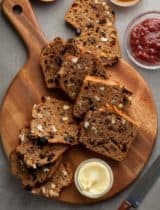 Haven't come across a recipe like this before, especially with the variety of seeds, and it looks so yum. Can't wait to try it out soon! Is there a possible substitute for the tapioca flour? :( they look wonderful, but i can't find that specific flour..
Hi Ellie, you need a starch similar to tapioca here to achieve the right consistency so I might try arrowroot but I haven't tested it with arrowroot so I can't say for sure what the final results will be. You can usually find tapicoa flour at most Asian markets or health food stores, alternatively you can order it online from Amazon. I hope that helps! I really want to try this ones. My little one is kind of obsessed with anything that snaps! I wonder if you can use almond flour as opposed to grinding sunflower seeds, until powdery? Any thoughts? I have lots of almond flour to use up! That should work just fine as well! Any particular reason white chia seeds are preferred? I've been making plantain and coconut oil crackers because it was the only doable nut free cracker recipe I had found. I have a hard time getting them just right and not burning them and they take at least an hr (usually more) to bake so I'm super excited about this recipe and seems more nutrient dense too! Hi Holly, it's just for color, you can substitute regular chia seeds if you prefer. I hope you enjoy them! Best crackers ever. Thank you!